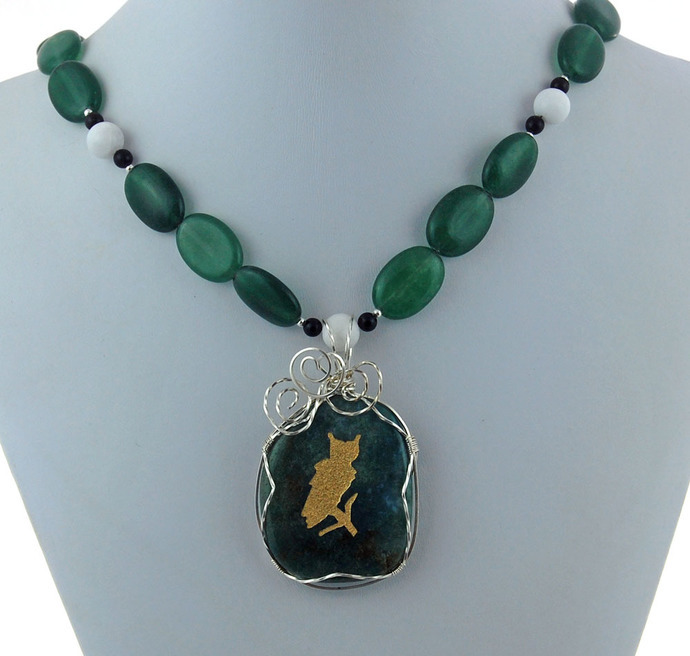 The handmade designer pendant necklace begins with a stunning gold owl engraved on a beautiful piece of green agate. 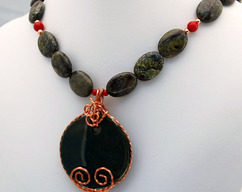 It is wrapped in shimmering sterling silver wire in our original design and sways from a necklace of white jade, black onyx, green agate gemstones with touches of sparkling silver. 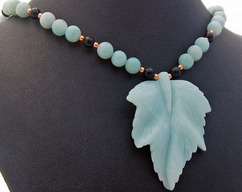 The original one of a kind designer necklace is princess length at approximately 17 ½ inches long. A 4 ¼ inch sterling silver extender chain gives you the option of wearing this stunning chunky necklace at a longer matinee length. A sterling silver lobster clasp comlpletes the design. The unique forest green owl pendant is approximately 1 ¾ inches by 1 ¼ inches with a 2 inch drop. Metaphysical information is given for your interest. 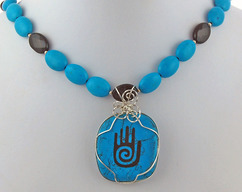 Rivendell Rock Jewelry makes no claims for the healing value of any or our jewelry. The owl represents wisdom, intuition the ability to see clearly. The owl is the protector of the home. Agate protection, strength, harmony, enhances intellectual and creative energies. 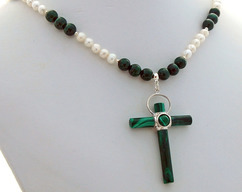 Jade can help attract love, prosperity, harmony, peace, serenity, wisdom, balance, and wisdom. Onyx is a strength stone. It assists with steadfastness, stamina, self-confidence, self-control, memory and wise decision making.